The IFLR 1000: The Guide to the World’s Leading Financial Law Firms 2014 has recognized Ilyashev & Partners as one of the leading law firms in Ukraine in Mergers & Acquisitions. In M&A, the work of Ilyashev & Partners has received good client feedback. One focuses on the advice of name partner Mikhail Ilyashev. «He is very innovative and quick, probably one of the best in the Ukraine; competent in many areas,» says one. Another observes, more generally: «I have known the firm for over ten years and have always been pleased with the service I have received from them». Ilyashev & Partners has secured a broad mix of work in banking and finance, including some large deals. The firm has done a lot of work for state-owned companies. One example saw Maksym Kopeychykov advising Fininpro in issuing a $650 million bond. In M&A the firm also advised a national company, representing Antonov ASTC in its merger with AVIANT Kyiv State Aircraft Plant. 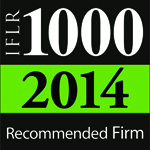 IFLR 1000 is an international rating directory specializing in the research of the leading law firms in the field of financial advisory services. The edition has been published since 1990 and conducts research in 120 countries worldwide.